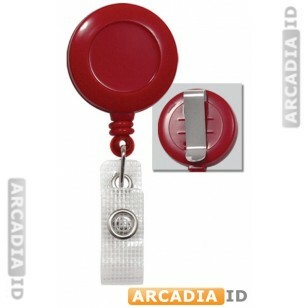 This red badge reel with swivel back clip and clear vinyl strap contains nearly three feet of cord. The round, plastic, badge reel comes with a swivel clip, which allows for some motion and flexibility for ease of use. Attach this reel to an ID Card that has been hole punched or to a vinyl card holder. This model is very popular with employees who have to swipe in and out at time slot machines, security check points or when entering sales at a Point of Sales station. CUSTOM ORDERS:The front side of this badge reel can be customized to reflect your company logo with orders of 100 or more. Please contact us for further details.